It was an enthusiastic and appreciative, mostly female audience that packed Chicago’s Nederlander Theater opening night. The book by Terrence McNally is expertly crafted to suit its intended audience of preadolescent girls who themselves are likely exploring their own future and place in the world. But it is also a cautionary tale that introduces some of the harsh realities of life while encouraging strength and resilience wrapped up in a very colorful package. The over dramatic dialogue and libretto reads like an early level young adult novel and does the job of moving the story along. In that way it is arguably not much different than most grand operas. The music and lyrics by the very talented team of Stephen Flaherty and Lynn Ahrens is reminiscent of traditional European “classical” music but lacks any memorable melodies or real thrills other than the occasional obligatory soaring song endings. I appreciate that this was directed by Darko Tresnjak to meet the expectations of a young audience and as such the performances were appropriate. If you get the lines out you are more than halfway there. Dmitry (Stephen Brower) and Vlad (Edward Staudenmayer) conspire to present Anya (Lila Coogan) as the rumored surviving Anastasia to the exiled Dowager Empress (Joy Franz) for the purpose of collecting a substantial monetary reward. Brower who goes from a bit lackluster to over-the-top and Jason Michael Evans as “Gleb,” the soviet official charged with exposing the imposter, might just dial it back a notch at the peak. Clearly they are trying to play this a little larger than life, which is okay, but maybe opening night adrenalin combined with their enthusiasm to interject some drama into their respective roles was neither drama nor melodrama just a bit too shrill at times which came off a laughable when it should have been serious. Based mostly in post WWI St. Petersburg and Paris, the costumes by Linda Cho were spectacular in their appropriateness to the time period and shear opulence when required. The Royal Romanov’s were elegant, ethereal and at time ghostly in their white-on-white brocade and ornamented dresses and uniforms. The contrast between the baggy gray coarse clothing of the new Soviet peasants contrasted with the sleek colorful Parisian flappers and expat dancing Cossacks at the Parisian Russian nightclub is a clear commentary on the changing fortunes and split between Eastern and Western Europe. The “Swan Lake” interlude choreographed by Peggy Hickey featuring Ashlee Dupree on point was a charming way to include the full spectrum of prepubescent female fantasy. 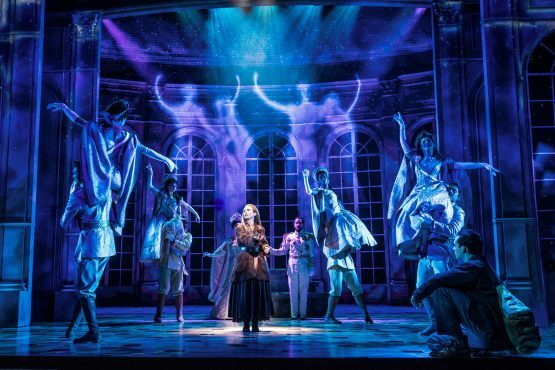 Likely because of my background in video I am a huge fan of cinematic projection in live theater and you will not find a better example of this art form than “Anastasia’s” scenic design by Alexander Dodge and Aaron Rhyne. It transports you from the Palaces in St. Petersburg to the bridges of Seine with myriad stops along the way including a delightful train ride. The former Oriental Theater built in 1926 is incidentally the perfect venue for this production as the obscenely ornate proscenium arch and interior seems like a natural extension of the Romanov period palaces. Devoid of any real humanity it is corporate entertainment at its best and exactly what some people want. That’s not to say I did not like it. Like the rest of the world I enjoy a good extravaganza, but strip away the glitz and there’s not much there. This spectacle is perfect for a girls’ night on the town or daddy daughter date. 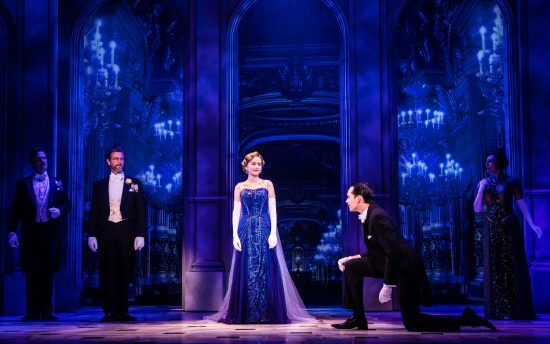 DETAILS: “Anastasia” has a limited two-week engagement at Broadway In Chicago’s James M. Nederlander Theatre (former Oriental), 24 W Randolph St, Chicago, through April 7, 2019. Running time: 2 hours and 25 minutes with one intermission. For more information, visit Broadway In Chicago.